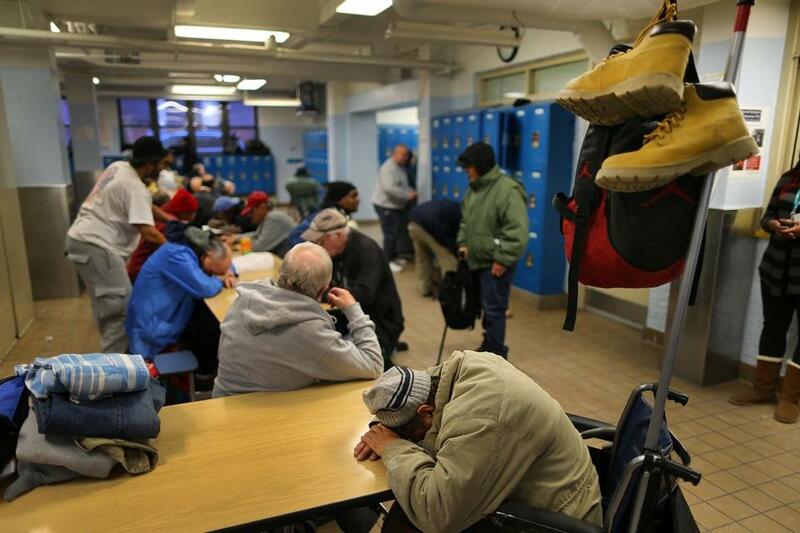 Last winter, the Pine Street Inn saw an overcrowding of homeless men trying to escape the extreme cold. Five years ago, Lyndia Downie had a crazy idea. What if Pine Street Inn, a haven for Boston’s homeless, reinvented itself, turning from an emergency shelter provider to a landlord? Downie, who runs Pine Street, warned her board it would be a hard-to-stomach decision, one that would involve closing some shelters and shifting those resources to instead buy homes. 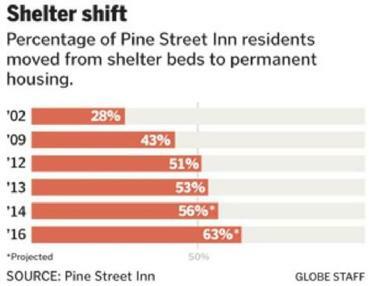 Today, that change is official: Pine Street Inn now manages more beds in homes than in shelters. Just a decade ago, the ratio was about 30 percent housing to 70 percent shelter beds. It’s a bold strategy and one the city, which also runs shelters, is accelerating under the Walsh administration. Could Boston be on the verge of solving chronic homelessness? “I am hoping within a handful of years,” said housing chief Sheila Dillon. That’s amazing, given that we just went through a deep recession, and signs point to a widening gap between rich and poor in this city, where there will be two Four Seasons but hardly anywhere for the middle class to live. What Downie saw years ago was buried in a trove of data she scoured: 5 percent of the homeless population took up more than half of the beds at Pine Street on any given night. The truth is that most people who come through Pine Street are there because of a temporary crisis. They often just need a place to stay for a few days. But Downie began to imagine what would happen if Pine Street focused on that 5 percent — the people who live on the street for months or years. Few people thought her idea would work. These street people didn’t want help. Not true. A year after moving into a Pine Street home — where they also receive counseling — 96 percent of the chronically homeless are still there. Downie didn’t come up with the idea of “housing first” for the homeless. It actually came from New York. But while it will take more than one good idea to solve New York’s massive problem, Boston stands a fighting chance. Our city has about 300 chronically homeless, down from about 570 in 2009. “That’s solvable,” Downie said this week at a former Mission Hill hospice Pine Street has converted into a 18-unit house, one of three dozen the nonprofit owns in Boston and Brookline. Overall, Pine Street manages nearly 900 permanent beds compared with about 670 emergency beds. And thanks to a recent $20 million capital campaign funded by private donors, it will be able to maintain those properties and buy more. If not for the Mission Hill house, Paul Sullivan would be in and out of shelters. He had a drinking problem that left him jobless and homeless. The former insurance administrator is now sober and has lived under the same roof for five years. Sullivan, 61, pays $238 a month in rent, or 30 percent of his Social Security disability income. He has his own room, and shares a kitchen and bathroom. It feels like a home. “The camaraderie is terrific,” Sullivan said. He does volunteer work and hopes to some day get a part-time paying job. The chronically homeless regularly end up in emergency rooms and tax public safety systems; keeping them in long-term housing adds up to an annual savings of $9,500 per person, according to advocacy group Massachusetts Housing and Shelter Alliance. That’s a big reason why the Patrick administration is also helping to fund Pine Street Inn’s “housing first” initiative, as well as similar efforts around the state, said Aaron Gornstein, undersecretary for housing and community development. No one is saying that emergency shelters will disappear, certainly not at Pine Street. But we have a shot at making chronic homelessness a thing of the past.